This is Alamayu's story, seen through his eyes: the battle, the journey to England and the trauma of an English public school as he comes to terms with the hand that fate has dealt him and tries to build a new life. 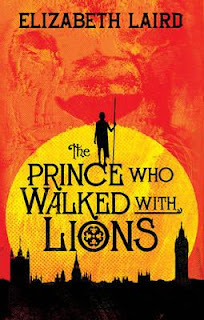 The Prince who walked with lions was an interesting read. I like Elizabeth Laird's style of historical fiction in that is always based on a huge amount of research of the events that book is about. The facts behind the story are solid and therefore the book is informative without being dull as the story-telling is spot on. I really enjoyed this book - it mixes between present tense diary format with flashback scenes following the Abyssinian prince and looking back over his life. I found getting inside his head really interesting and learning about the history of a country I knew very little about really engaging. An interesting and informative read.